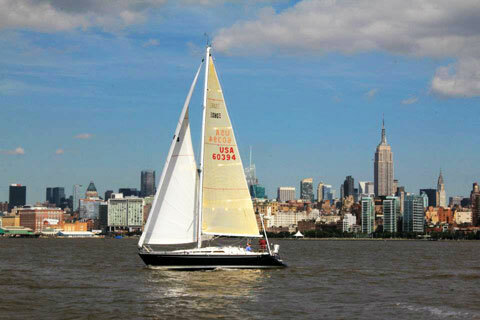 Coastal Cruising is an Advanced Sailing Course designed for Basic Keelboat Certified Sailors or those with equivalent experience. The goal of the Coastal Cruising Course is to prepare the student to cruise safely in local and regional waters as skipper or crew on an auxiliary powered sailboat in moderate wind and sea conditions. Chart reading, plotting and coastal navigation skills are stressed during this course. A.S.A. Coastal Cruising Certification is awarded upon successful completion of the written and practical exams which are included. Coastal Cruising consists of one 3 hour Tuesday evening classroom session plus two full days of sailing (Saturday and Sunday) from 9:00 a.m. to 4:00 p.m. each day aboard a beautiful 44 foot C & C Yacht with a maximum of 6 students per class. (see photo of yacht).